Over the last two years, Gotham has played fast and loose with the mythos of the Dark Knight. While the results have been somewhat mixed, it shows that the creative forces behind the show have certainly done their homework. We’ve seen proto versions of iconic Batman villains, and we will soon get to see a character whose morality falls into a somewhat greyer area. Of course, I’m talking about Azrael; check out the video below to see for yourself. Based on that above video, it’s clear that some bad things are headed to Gotham. Dr. Hugo Strange has resurrected the once-dead Theo Galavan and turned him into Azrael – a knight for the Order of St. Dumas. Exacting vigilante justice out on the streets of Gotham City, it seems that Azrael (much like his comic book counterpart) has no problem crossing the line Batman won’t cross. He begins to rack up a serious body count, leading Bruce Wayne and Jim Gordon on a mission to take him own. 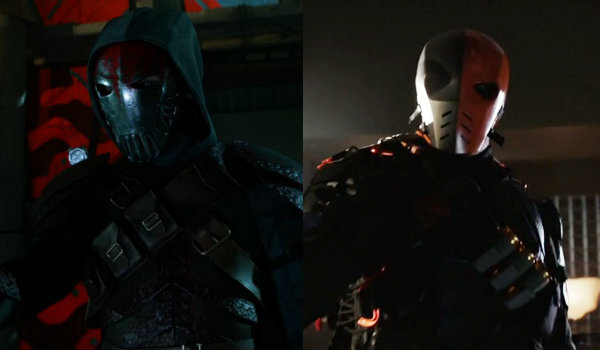 One of the interesting things to note about this iteration of Azrael is the fact that Gotham seems to also be injecting elements of Slade Wilson a.k.a Deathstroke into his characterization. Most notably, he has a line down the front of his mask, causing one side of his face to look black, and the other to look red. His combination of swordplay and firearms also seems like homage to the legendary mercenary more than the traditional Azrael. As a character, Azrael has had two distinct variations in the comic books. His first iteration came about during the landmark Knightfall story arc, in which Jean-Paul Valley took over for Batman following Bruce Wayne’s defeat at the hands of Bane. The second version followed a much different storyline, acting as a title passed down to assassins employed by the Order of St. Dumas. Gotham seems to be moving towards the more contemporary St. Dumas version of the character, which makes sense when we consider the fact that there’s no way that Knightfall could have taken place yet. Although Gotham’s depiction of Azrael seems like a stark departure from his comic book counterpart, it also seems like an incredibly badass new direction for FOX to take the character. We will keep you up to date with all of the latest and greatest Gotham news as it become available to us. Be sure to check out Azrael’s debut this coming Monday when Gotham: Rise of the Villains airs on FOX.